Here is the second Warby Parker blog post recapping all the sunglasses I got to try! If you're new to my blog, I've taken various pictures of me wearing Warby Parker frames in the past so people can have an easier time choosing a frame to purchase or add to their home try-on box. You can check out all the blog posts here. 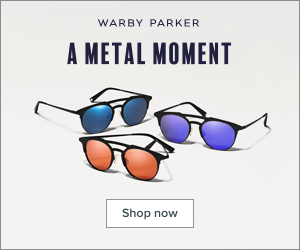 In this Warby Parker post I'll be talking about the eye-catching Quimby frames! The Quimby were by far the most liked frames when I made my Warby Parker video and posted the picture on my Instagram. The Quimby are very large, round, and eye-catching sunglasses. If you want to stand out in a crowd then these are the sunglasses for you. Both the length and width of the glasses are considerably bigger than your average pair of glasses which would make these an ideal pair of glasses for those with bigger eyes. The Quimby also has a keyhole bridge which makes the glasses very comfortable to wear. The reason why I personally didn't like the glasses on me was because they emphasized my round features. My nose, face, and cheeks are round so with these glasses I just felt like my face was lacking definition. I think the Quimby would look perfect on a more angular face with prominent cheekbones or someone with a stronger jaw. The Quimby frames retail for $95 without a prescription and $150 with prescription.